One of the reasons that Esperanza Resort is one of our favorite venues in Cabo San Lucas is the amazing expanse of locations to shoot! We absolutely fell in love with this unique tangerine-colored corridor. The bride stands, looking off into the distance with her bouquet in hand. With her other hand, she holds onto her veil as it sways behind her. The white of the wedding gown contrasts with the pale orange walls. 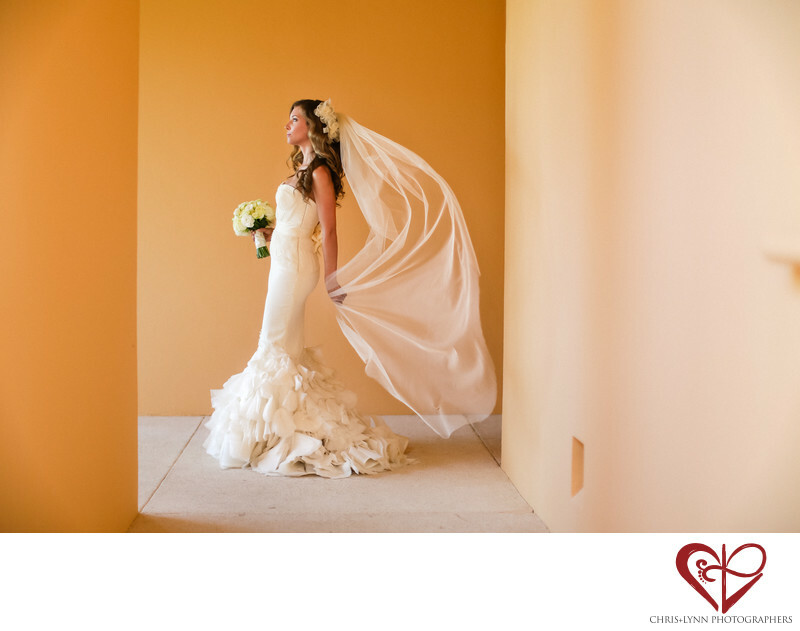 All across Baja California, we come across fun, brightly colored walls that we love to use as backdrops for portraits! As the bride posed for a full shot, a gentle breeze swept through the hall from outside, picking up her veil and making it dance behind her. We love the way that the motion of the veil allows us to capture movement in our portraits. 1/400; f/1.2; ISO 100; 50.0 mm.